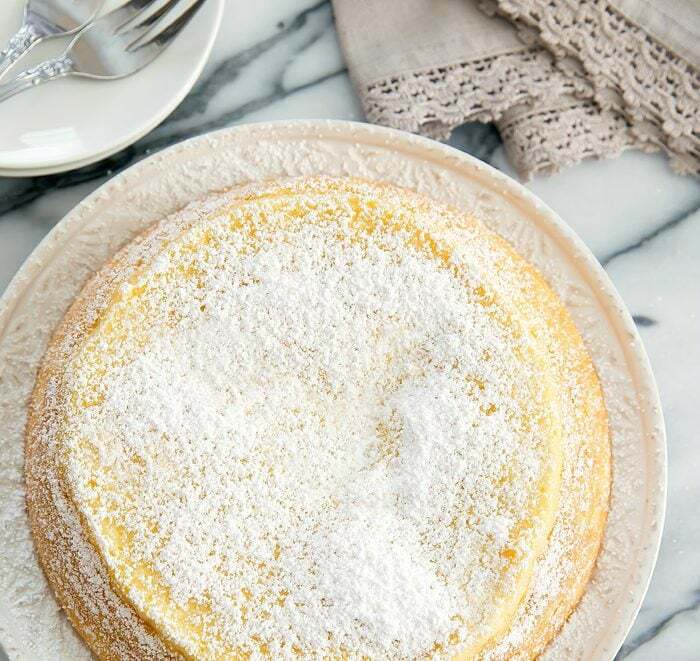 This Japanese-style souffle cheesecake is just three ingredients. 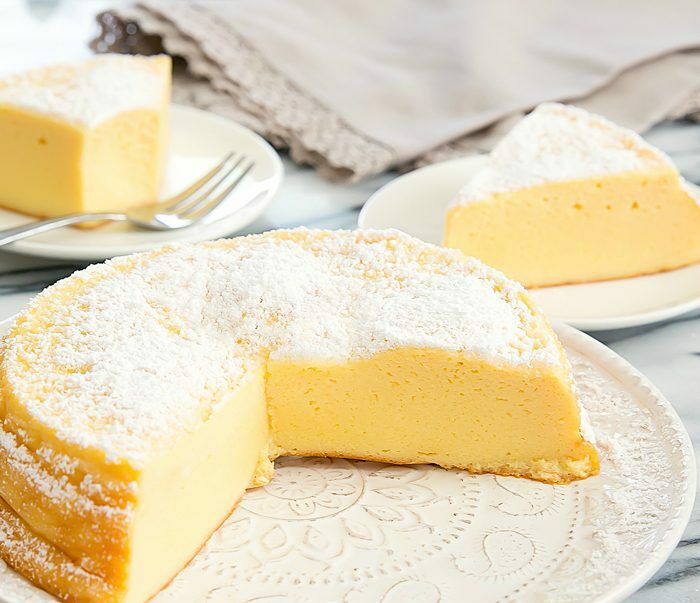 It’s light, fluffy, and a shortcut version of the traditional Japanese cheesecake. I’ve made Japanese cheesecake before but it’s time-consuming and if you don’t make it just right, it collapses. 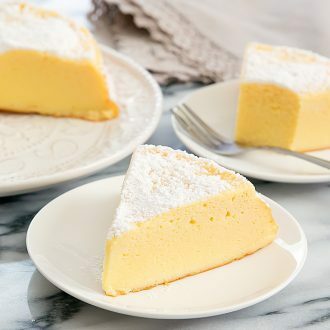 So I was really excited when I came across a 3 Ingredient Japanese Cheesecake recipe. 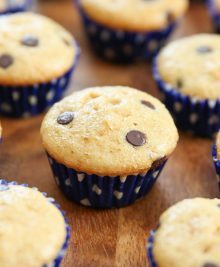 A three ingredient recipe is much more manageable! The recipe actually was an internet sensation back when it was first published, but I somehow missed out. So this past weekend I set about making my cheesecake. It didn’t go quite as planned. The first three attempts were complete fails. I wasted 18 eggs, 3 blocks of cream cheese and 2 bags of chocolate to have soggy, eggy cakes that were barely edible. Of course, my husband took this moment to comment that he didn’t think that the recipe would work. Because that’s what you want to hear when you pull out your third failed attempt. However, I regrouped, did some more research and finally got it to work. Turns out, I should have tried the original recipe first instead of trying modified versions that were published after because the original one is the one that ended up working best for me. This cake came out quite lovely. I don’t think it’s better than the classic version but it is a tasty quicker version and I’d make it again. 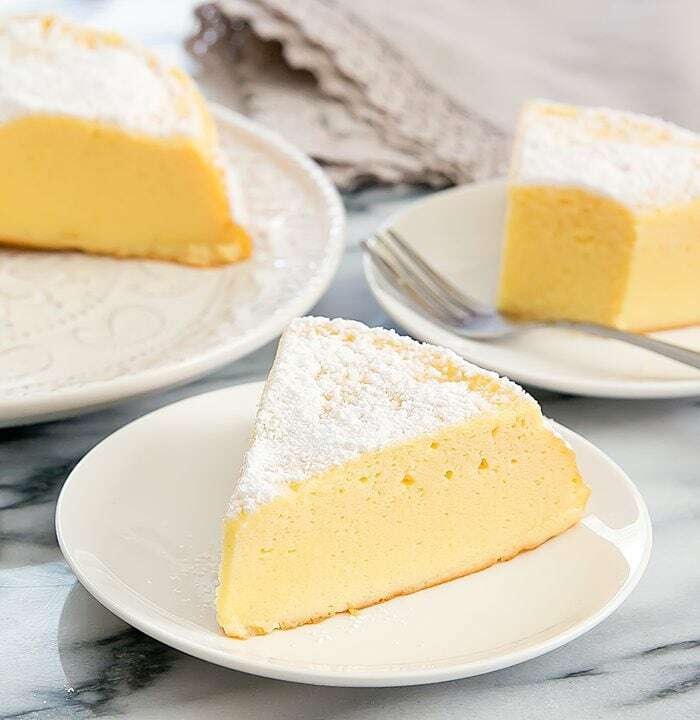 Light and airy Japanese cheesecake can be made with just 3 ingredients! Preheat oven to 338°F. 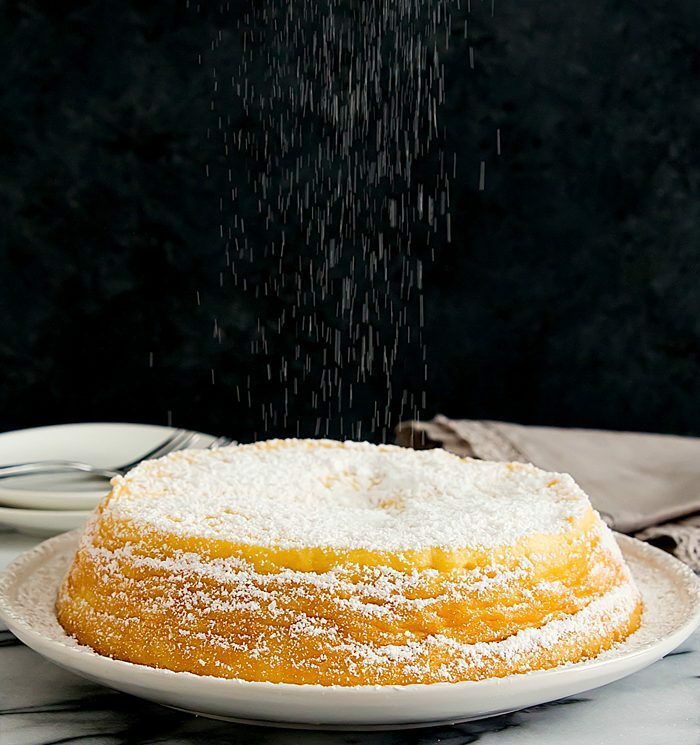 Grease and line a 6 inch round cake pan or 6 inch round springform pan with parchment paper. Please use a pan that is at least 3 inches tall as the cake will rise quite high. If you are using a regular cake pan (fixed bottom), make sure to create 4 parchment paper handles that will allow you to lift the finished cake out easily (basically two long strips of parchment paper that will run down inside one side of the pan, across the bottom and up the opposite side of the pan. The two strips should cross and form an "X' in the at the bottom center of the pan. The strips should be placed underneath the parchment paper being used to line the cake. This way when your cake is finished, you can grip the four handles and lift your cake. If you are using a springform pan you won't need these handles and just need the parchment paper lining the cake pan. Separate your eggs. Keep the egg whites in the fridge until ready to use. 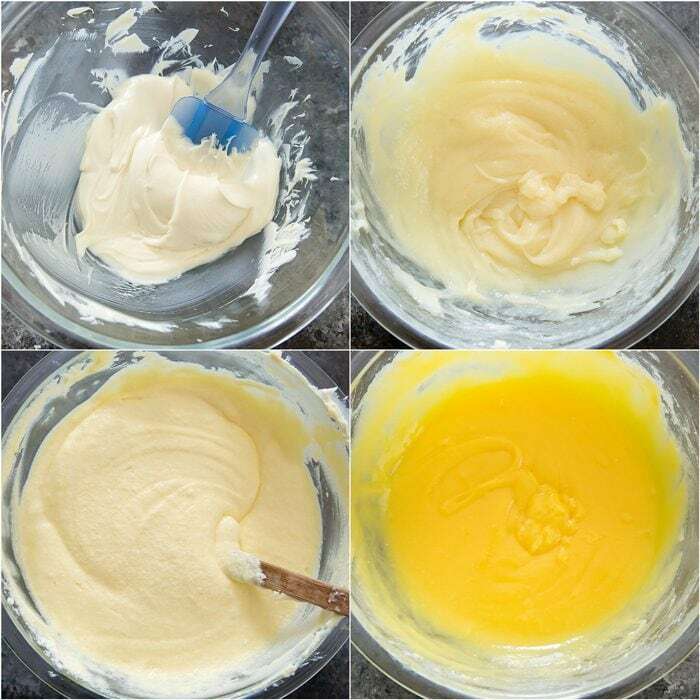 Make sure your egg whites do not touch any oil, water or other ingredients or they will not whip up properly. Melt chocolate either over the stove or the microwave. For the stove you can use a double boiler, or melt the chocolate in a large glass bowl sitting on top of a simmering small pot of water. For the microwave method, microwave at 20 second intervals, stirring in between, until chocolate is completely melted and smooth. Add in the cream cheese and whisk until smooth. Add in the egg yolks and whisk until smooth. Beat your egg whites on high speed with an electric mixer until glossy, stiff peaks form. You should be able to hold your mixing bowl upside down without any of the meringue falling or dripping out. Add one third of the egg whites to your yellow batter. Gently fold in the egg whites with a spatula until just incorporated and there are no white streaks. Fold in another one-third. Fold in the final one-third. Pour batter into prepared cake pan. Tap the bottom of the pan a few times against a hard surface to get rid of air pockets. Add about 1/2 inch of water into a large baking pan that can hold that amount of water. 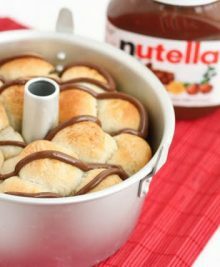 If you are using a regular cake pan, place the pan into the water. If you have a springform pan, cover the bottom of your springform pan with several layers of foil to prevent water from getting in. Make sure the foil runs across the entire bottom and up the sides. Do about 4 layers to fully protect the pan. Place cake with the water bath into the oven. Bake for 15 minutes at 338F. Turn the heat down to 320F and cook for another 15 minutes. Turn off heat but leave the cake in the oven to cook for a final 15 minutes. Remove cake from oven and allow it to cool. Cake will shrink slightly while cooling. It can be served right away but it is best to let it set in the fridge for several hours to allow the cheese flavor and sweetness to fully develop. When the cake is first out of the oven, it will have a stronger egg flavor. Recipe slightly adapted from ochikeron. I tried this recipe on Wednesday and in first 20 minutes in the oven it looked like a perfect success but then it suddenly collapsed and we ended up eating a flat pancake. A delicious, juicy pancake if I may say. 🙂 No problem, I’ll just try again or maybe even try the original recipe that takes a lot more time. 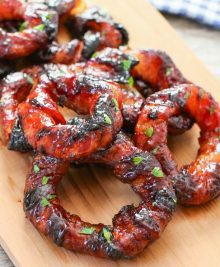 Thank you for writing this blog, I get a lot of ideas from your recipes and there is some drooling inolved while reading about your restaurat visits. Hi, I’m sorry yours collapsed. Did yours collapse while it was still baking? I wonder if maybe your oven cooled too quickly during the last 15 minutes. Yes, it collapsed while baking and I guess it happened in the last 15 minutes of baking. Did you bake this cake without the fanfunction or with it? I used the program with upper and lower heating + fan. Maybe next time I’ll try without the fan. i used a conventional electric oven with no fan. I think you may need to adjust if you are using a different type of oven. You may need to keep the heat on rather than turning it off the last 15 minutes. Can I add Lemon Juice, or vanilla to add more flavor? yes that should be fine. thank you!